Big iron slingshot fires projectile. Close up on green iron slingshot placed on lawn, rubber stretched and fires. 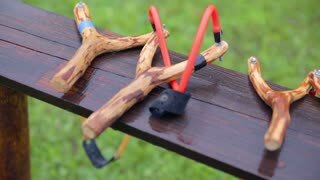 Wooden slingshots panning over close up. Professional made slingshot for competition waiting on desk. Close up slingshot hit the target. Big white and black target on green field and someone fires a projectile at it. Preparing to shot with slingshot close up. Man puts an iron bullet in to cap of slingshot and shoots. 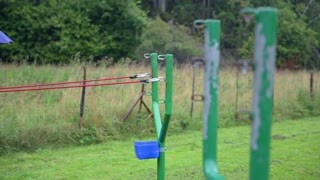 Person prepares for slingshot shooting. 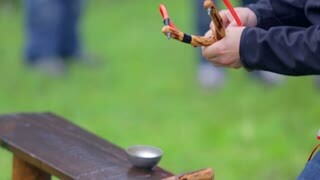 Close up of male hands putting projectile in to slingshot holder and fires. 1950s: High school classroom. Teacher speaks. Group of boys talk and play around. 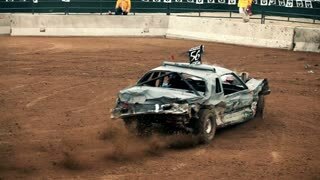 Boy pulls back rubber band. Having fun with a inflatable water catapult. 1950s: Boy loads rifle, aims, shoots at can. Boy shoots at bucket. Woman shoots bow and arrow into wood. Boy shoots slingshot. Installation of the heroes of the popular PC game "Angry Birds" on the Embankment in Moscow. Juno spacecraft making a gravitational slingshot pass of Earth. Data: NASA/JPL. Focusing through targets on slingshot biathlon. Close up of small circle targets for slingshot competition. 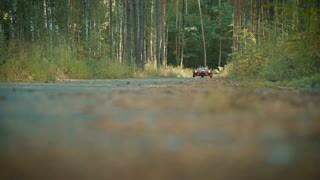 Kid shooting with slingshot close up. Young kid hands preparing for slingshot shooting, fires at target. Hitting first target. 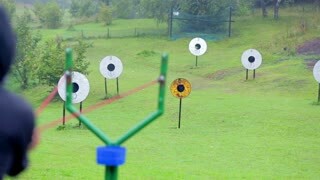 Middle shot of targets for slingshot competition, hitting first target. Big slingshot shot and hit the target. Focus pulling from stretching huge slingshot and hitting the target on field. Person fires at target with slingshot. Close up of male from behind and target in background, firing with slingshot and hitting. Preparing more projectiles for slingshot. Close up of person taking iron projectiles and putting in a small bowl. Firing artillery slingshot close up. Iron slingshot place in ground while someone stretches the holder for firing projectile. 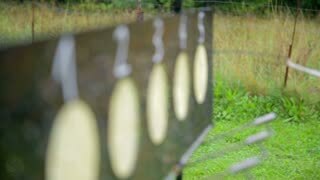 Firing with huge slingshot at big targets, taking a hit. 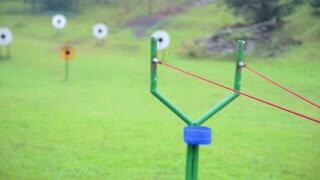 Person shoots at target with big iron slingshot on a huge green lawn. Tilting over big iron slingshot artillery on green field. 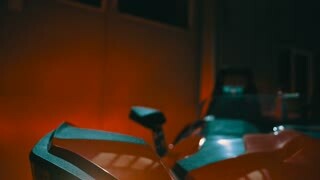 Close up of huge dangerous slingshot. Long shot with lens effects and nebulae: the Cassini spacecraft in a slingshot path around Earth's Moon. Reversible, can be rotated 180 degrees. Elements of this image furnished by NASA. Girl rocker leaned on a brick wall, straightens his hair and shows a slingshot with your fingers at the camera.